Anyway, the video shows my geekery when I get new things. Let me know what you guys do with your SQ-1. I'm new and want to learn how to master this little beast! Nice review and demo/song. Nice accent, I have a similar one. I've just bought an SQ-1 myself, after years of saying "I don't need another stepsequencer that only does two bars". 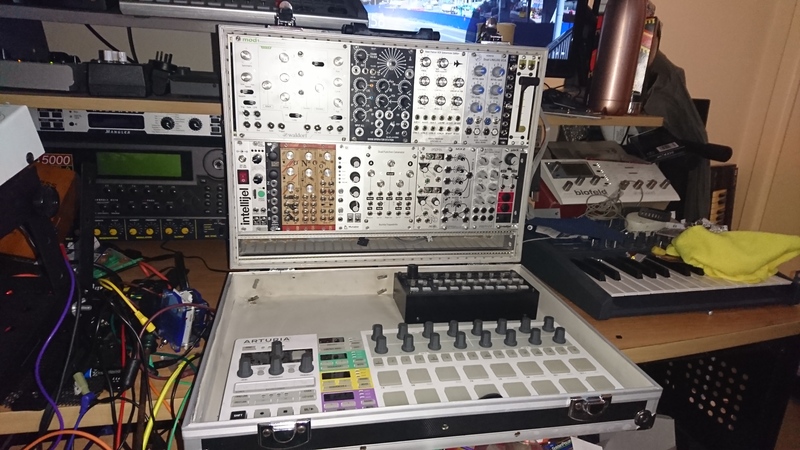 Yeah right, as if I don't need another stepsequencer now I have a modular synth. Three of the things running into the eurorack and still have a Pyramid looking over my shoulder saying "I can do that too, why are you ignoring me?" Using the SQ-1 currently to control sample selection on a Disting and the cutoff frequency of the filter the samples are running through. Got it clocked via a Pamela's New Workout channel which in turn has it's rate controlled by an LFO to produce semi-random stepping as the tempo speeds up and slows down with the LFO. The idea is to emulate flicking channels on an old analogue broadcast television. I've loaded the Disting with entire audio-tracks from old horror and sci fi movies, talkshows, youtube conspiracy channel videos, "it was aliens" tv shows, etc. You get the picture. It's all going through a Steiner Filter clone with an input for each filter state, meaning I can essentially fade between the different inputs as the filter frequency moves through the audio spectrum. Basically it's the opposite of a regular Steiner filter i/o scheme of 1in:HPF/BPF/LPF out. I'm going to try to get a recording happening soon. Something not mentioned in the thing they passoff as a manual is when the sequencer is stationary, you can put it in stepjump mode and trigger the voltages for each step by selecting it with the step button. You can change the step value with it's knob, then retrigger the step by pressing the button and hear the change applied. Great stuff for quickly sending a preset value to a destination. One of my first thoughts once I'd sent the two CV outputs off was "I wonder what comes out of the 'littlebits' output?" so I looked it up. Turns out it's a combination of gate and pitch CV from sequence A. That essentially adds a third CV output, but I tried it out and didn't really notice it doing anything. Could have been I had the duty CV down too low or I just had so many other modulations going at the time I couldn't discern it's effect for all the others. I have no idea if it's a v/oct, hz/v or whatever voltage output as it wasn't mentioned in the article I read. I'll have ago again tonight with just it on an Oscillator and see what happens.